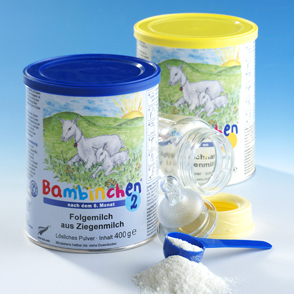 1 can of Bambinchen 1 produces approx. 3 litres of baby formula. 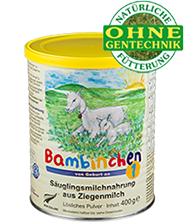 For diets consisting solely of Bambinchen, 1 can lasts approx. 3 days. Full-cream goat’s milk powder 43% (heat-treated), lactose (from milk), vegetable oils (High-oleic sunflower oil, rapeseed oil, sunflower oil, antioxidants (sunflower lecithin, mixed tocopherols)), minerals (calcium citrate, sodium citrate, calcium hydroxide, iron sulphate, potassium chloride, zinc sulphate, copper sulphate, manganese sulphate, potassium iodide, sodium selenite), vitamins (vitamin C, vitamin E, niacin, vitamin A, vitamin D3, calcium-D-pantothenate, vitamin K1, vitamin B12, vitamin B1, vitamin B2, vitamin B6, folic acid, biotin), choline chloride, L-tryptophan, L-isoleucin, taurine, L-carnitine.